Long before the San Antonio Spurs appointed the NBA’s first female coach a (OK, fictional) down at heel inner city Chicago high school appointed a football mad, just ditched mum (Hawn) as head coach of its losing, seen better days rag-bag football team. In a turn of events that could have only come as a surprise to those who’d never before seen a 1980s movie Hawn eventually wins over her team of delinquents, which includes Wesley Snipes and Woody Harrelson, to lead them all the way to the city championship – against all the odds. While Uncle L, Hawn and football have all outlasted 80s fashion (Hawn and football, in the States, of course having established their place in popular culture before Reagan took the keys to the White House) Wildcats is a relic of the time when I was about 10 years old and the sport was my all consuming passion. 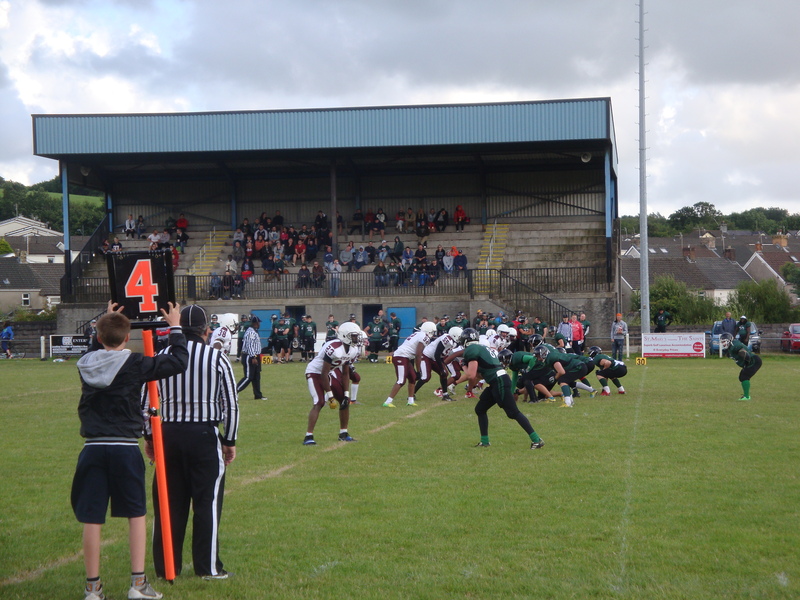 To see a live game once more, on Sunday, August 10, I took the 25 minute journey from Cardiff, to Llanharan home to Wales’ only surviving adult (non-university) team, the South Wales Warriors who compete in the British American Football Association (BAFA) National League Premiership South. 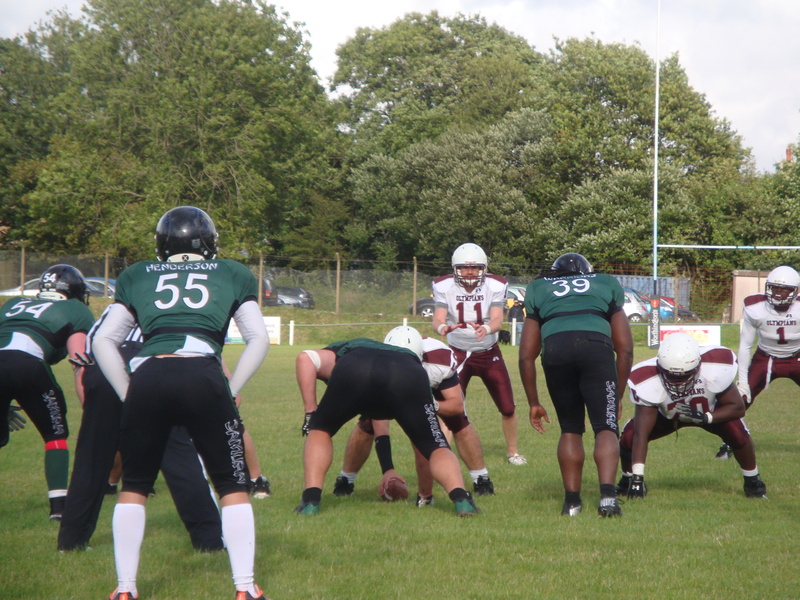 Their opponents; the London Olympians – one of the most successful teams in ‘Britball’ history having even won the European championship in 1993. To see the Olympians, although reformed since their own and Britball’s heyday, was special as they represent the late 80s golden age of American football. 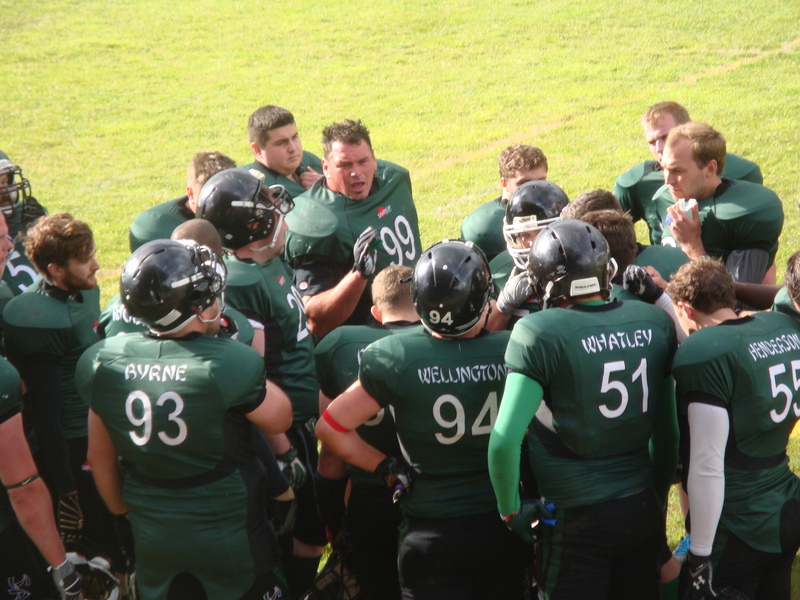 The London Ravens had been Britball’s original dominant force and for years were famously unbeaten, and thought to be unbeatable. I seem to remember the Olympians being the team that finally beat the Ravens. 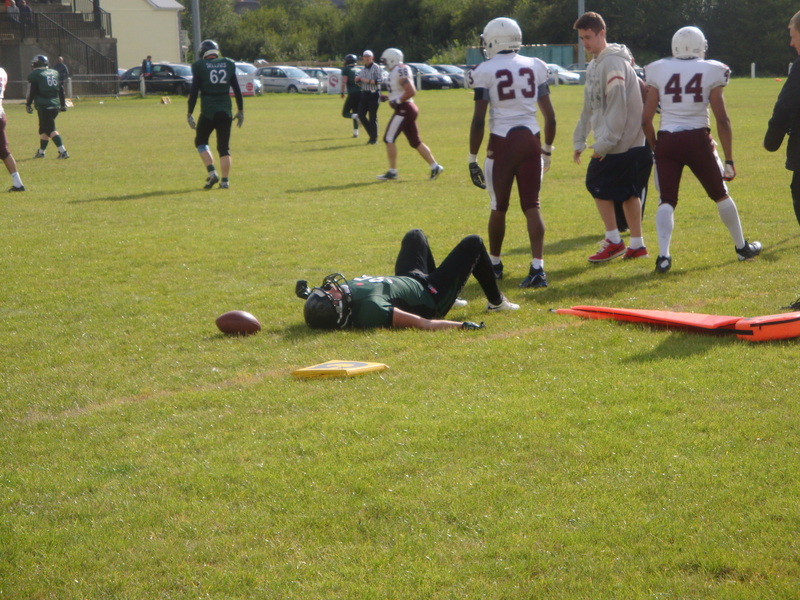 Like almost every American Football fan in the UK my young passion was fired by NFL highlights on television but best of all the thud of helmets smashing against shoulder pads could be found at my local park, where the Cardiff Tigers trained. Swansea and Newport also had their own teams, while the Tiger had their own cross city rivals, the Cardiff Mets. Me and my brother used to watch the Mets play at Cardiff Arms Park, home of Cardiff RFC who are recognised as the ‘World’s greatest club’, after the Tigers were forced to switch their home games to Bridgend, some 30 minutes away. The Tigers had been playing at Cardiff City’s Ninian Park but had to find a new ground when a rare promotion meant as a now third division side the City thought it should take better care of its playing surface. Over the years, as me and my bro took on ball-boy and chain-gang duties, the squads got smaller and the stadiums were swapped for recreation grounds. We both advanced to play youth football, both quarterbacks, for first the Mets and then The Tiger Bay Warriors. The Tiger Bay team had a short lived period in the declining senior leagues and eventually disbanded, only for the new South Wales Warriors team to be born. While the Warriors concentrate on football as a recreational sport for its players, in contrast to the 80s when clubs thought of themselves as entertainment, its base at Llanharan RFC has a ramshackle grandeur that provides a fitting stage for hard-nosed endeavour. Entry to the Dairy Field is free and an encouraging number of supporters, swelled by family and friends, had come along with the main grandstand looking pretty full during the first half. As is common at rugby grounds the seated area is elevated to just the right height for American Football allowing spectators a clear view of the field, despite the mass of bodies on the sideline. Perhaps the NFL might like to consider the Dairy Field for its British fixtures rather than using banners to cover lower tier seating at Wembley? With forecasters and the looming dark clouds promising the tail-end of hurricane Bertha would be unleashed for the Olympians visit the grandstand and the covered terrace area on the opposite sideline provided a welcome reassurance, especially when one of the expected showers, beautifully illuminated by bright sunlight, came in the third quarter. There is much more to the Dairy Field however than shelter from the British summer, the club tea/snack bar was open (60 pence for a tea or coffee, and a four out of five star rating from the Food Standards Agency) while the club house bar means supporters can enjoy a pint with the game. If you’re unfamiliar with LL’s Football Rap or Wildcats, click here. This entry was posted in Sports and tagged American Football, British American Football Association, Cardiff, Goldie Hawn, Gridiron, London Olympians, National League Premiership South, NFL, San Antonio Spurs, South Wales Warriors, the Warriors, Wesley Snipes. Bookmark the permalink. Great piece, Twm… but it’s worth remembering that the Tiger Bay Warriors appeared in the Division 2 Britbowl in 1999, where they lost a close game to the Chester Romans. So, their existence was neither short-lived nor declining; they went out on a high. A number of players retired after the loss in the final, so they took a year out and reformed in 2001 under the new name. Thanks for reading and commenting Tim. I should make it clear I meant the leagues (there used to be more than one) were declining rather than the Warriors and I certainly meant no offence. I didn’t want to get too bogged down in the history but tried to give some perspective on what is, I think, now 30 years of football in South Wales. Wow, now that brings back some old memories. I used to play WR for the Mets in 1987/88. Theres not much on the web about the Mets, and I’ve never come across any pictures at all. Paul. Thanks for your comment Paul, glad to have brought back some old memories. That’s what inspired me to go and take in a game in August last year, which led to me attending every home game this year. As I wrote I had great times watching the Mets at Cardiff Arms Park with the game against the Vancouver Meralomas being a particular highlight. As nearly every social event is recorded on social media or digitially now it can be frustrating when failing to find similar records from not that long ago (less than 30 years).